According to the Oxford English Dictionary medicine is the science and practice of diagnosis, treatment, and prevention of disease. The American Heritage Dictionary goes further and says the art or science of restoring or preserving health or due physical condition, as by means of drugs, surgical operations or appliances, or manipulations. Few medical professionals would disagree with these definitions although they might suggest medicine more often involves treating ailments rather than preserving health. In human society it is rare for people with illness or injuries to be abandoned to their fate, it happens, often during war or major pestilence, but on the whole humans are a caring species who look after and comfort the less capable within their family or tribe. Evidence that this trait was valued even in hunter gatherer societies is strong, archaeological digs have unearthed carefully arranged burial sites containing human remains that had been injured or passed away from illness. Lascaux cave paintings of herbal plants suggest that ancient nomadic people knew of the recuperative effects of certain herbs, there have even been suggestions that morphine and digitalis may have been discovered in pre-historic times. Certainly we know that indigenous peoples, even those who have been remote from the rest of the human race for hundreds or thousands of years have all practiced a rudimentary form of medicine mixed with faith. Surgery, even brain surgery, was not unknown. Archaeologists have uncovered evidence that stone age people would sometimes drill holes into the skulls of people they believed to be under the influence of evil spirits. Called trepanning, the technique involved cutting and folding back the scalp then using a sharpened stone to drill a hole into the skull which in some instances was as big as two inches in diameter. We have no idea how the wound was treated so that it would heal but we do know that the patients often survived the procedure and the bone would grow back. 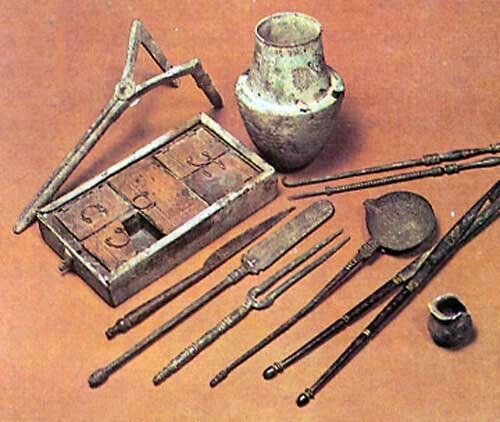 Recent discoveries in present day Pakistan at Mehrgarh prove that the earliest rudimentary medicine developed around 9000 years ago, with people in the area been practicing dentistry and surgery since 7000 BC. Sadly the Mehrgarh civilization disappeared around 2600BC and not much is yet known about their civilization since archeological digs are continuing. Coincidentally around the same time the Mehrgarh civilization disappeared (2600BC). ancient Egyptian and Chinese civilization were beginning, both of which then developed (supposedly independently) their own medical practices including dentistry and surgery such as amputations. 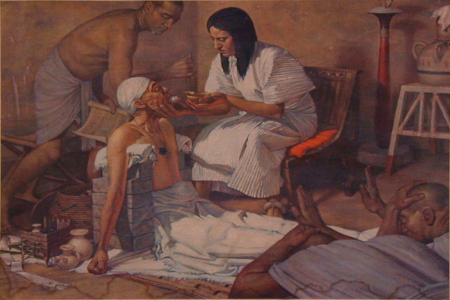 Egyptian medicine was heavily reliant on the intervention of the Gods and no illness would ever be treated with consulting a priest-healer who had been purified and was known to be a reliable conduit between the living world and the world of the gods and spirits. Each god was known to have certain powers so it was important that the correct healer was approached who would guide the sick person thru the spells and prayers that were needed ensuring mistakes weren’t made. Herbal remedies and other cures that in today’s world seem quite primitive were in Egyptian times considered to be very appropriate and nobody would dream of not doing as they were instructed. The ancient Egyptians also left a wealth of surgical tools and prosthetics for modern medical professionals to marvel over. 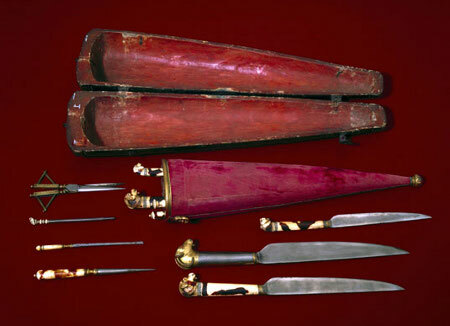 Hooks, surgical knives, and casts were every bit as sophisticated as 19th century medical instruments yet were in use as long ago as the 27th century BC including the surgical suture and creams to assist healing after surgery. Egyptian society was also quite used to the idea of seeking potions from people we would recognize as pharmacists. However advanced Egyptian medicine was, many of the treatments were very primitive and would have meant enduring a lot of pain, whilst some illnesses could not be treated and papyrus writing suggests death would be inevitable. Tetanus or a serious tooth abscess, both of which are trivial to treat today were causes of certain death in Egyptian times. Neighboring civilizations in the Near East also developed medicine taking all the best ideas from Egyptian medicine, with Greek and Babylonian priests at the forefront of medical thinking. Babylonian medicine which developed from around 1500 BC reached its peak a few hundred years later and gave the world a book entitled the “Diagnostic Handbook” which describes the process a practitioner needed to follow to diagnose illness. Questions were to be asked and physical examinations undertaken before a prognosis could be arrived at, and definitely before any treatment commenced. Babylonian medicine isn’t much known but the Diagnostic Handbook survived thru the ages first to Greek, and then Roman medicine. Greek medicine, in some ways the successor to Egyptian medicine but with a slightly greater emphasis on the physical rather than the metaphysical and is the true ancestor of modern medicine. The Hippocratic Oath required of all medical professionals before being licensed is named after a Greek philosopher and man of medicine Hippocrates who developed his own rules of ethics for medical practitioners. Hippocrates has been described as the first chest surgeon and wrote copiously on the anatomy of the lungs, his findings are still considered relevant today. Greek medical practitioners were unique amongst the ancient world in that many weren’t first and foremost priests, instead they were philosophers and learned men who were also knowledgeable about the various gods and their powers. It was during the Greek era that many of the medical terms in use today were first coined to describe types of diseases and illnesses, and the types of remedy required, and it was in this time that anatomy was most progressed thru dissection of human bodies. Rome had discovered the link between health and hygiene and were the first civilization to fully develop a system of clean water aquaducts and waste sewage systems. Galen, a prominent Greek surgeon whose writings remained the mainstay of anatomy knowledge until renaissance times traveled to Rome and advanced Roman knowledge of surgical procedures and is believed to have discovered that boiling surgical instruments in hot water would reduce infection. Galen is considered the greatest surgeon of the ancient world having performed many surgeries that even 19th century surgeons were not willing to attempt. An earlier surgeon who is these days considered a rival to Galen for the title of greatest surgeon of the ancient world was unknown to western medical thought until the colonial age. Sushruta, from the ancient Indian city of Kashi who lived in the 7th century BC, developed his surgical skills and powers of diagnosis and was the first person in the ancient world to fully describe many illnesses unknown to his Greek and Roman peers. Cosmetic surgery was pioneered by Sushruta, and in his seminal work Sushruta Samhita he described Angina, the human circulatory system, diabetes, hypertension, leprosy, obesity, and stones in the organs. Post Roman medieval society all but forgot the teachings of the ancients and reverted to superstition and mysticism in many parts of society, medical science reverting to a standard little better than an advanced form of first aid. The only major exception was the craft of midwifery the survival of which is claimed to have been the perception that midwifery wasn’t true medicine anyway being women’s business. Many midwives retained ancient herbal remedial knowledge despite the advent of the dark ages yet throughout medieval times needed to be discreet about their undoubted medical knowledge or potentially face accusations of being witches, a fate that was never pleasant for the accused. In contrast, the Muslim world had no qualms about adopting science knowledge from the highs of Greek and Roman civilization. The turn of the first millennium was a golden age within the Islamic world, even seeing scholars develop new science and coming close to inventing technologies such as flight, electricity, or optics that western scientists didn’t develop until after the renaissance period. In many ways Muslim period medical knowledge far outpaced anything known to the ancients, with most of the most influential Greek and Roman medical books being translated into Arabic by the late 900s. Arab surgeons and philosophers were also the first to adequately describe the complete circulation system and disprove many of the mystical ideas inherited from Greek writings. By the end of the 13th century Arab scholars had added mathematics to medicine allowing for accurate pharmacology in the creation and prescription of medications as well as giving surgeons and doctors a means of predicting the course of an illness using observation, empirical evidence and mathematics to calculate the most critical times of the illness, thus making dosage more specific to the patient. The golden age of Islamic science and medicine also saw the invention of the syringe for medicating patients, the existence of the human immune system, the separation of pharmaceutical science from the practice of medicine, and further afield in India which had been heavily exposed to Islamic sciences, the invention of the art of inoculation. Whilst Europe was firmly in the grip of feudal ideas and the idea that a man was born to his position, the Arab world was experiencing the best medical care the world has known until the late industrial age ushered in modern medical science. The decline of the Arab period left a vacuum in medical knowledge that wasn’t filled until the advent of the renaissance at the end of the reformation years, yet even in these times scientists and medical practitioners still needed to be careful that their findings didn’t contravene Catholic teaching too much since excommunication was still practiced, and even within the new protestant nations scientific research was still very much frowned upon by puritanical churches. Some of the best known renaissance era medical researchers operated in complete secrecy, or as much as that was possible, an example being Leonardo Da Vinci who advanced our knowledge of human anatomy and the venal system by hiring gravediggers to bring him recently deceased human remains to experiment on. Whilst Da Vinci is not considered one of the great medical surgeons, he was in fact an artist with a wide variety of interests, he did at least make it possible for later generations of surgeons to study his anatomy drawings and reach their own conclusions. No history of medicine would be complete without mentioning Andreas Vesalius, a Belgian doctor who more than anyone in European medical science established the truth of many myths that had been held true since Galen in the Roman era. 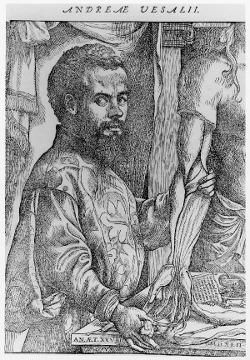 Vesalius had been fascinated by Galen’s findings and endeavored to create a complete map of the human body, but in so doing disproved many of Galen’s most important hypotheses. Vesalius published his findings entitled De humani corporis fabrica in 1543, a seven volume masterpiece illustrated with the assistance of professional artists and quickly becoming the authority on anatomy. With the changing political and religious landscape modern medicine since the advent of the industrial age has moved forward almost exponentially, and whilst 21st century patients might still describe medical science into the 20th century as quite barbaric, the truth is that the rapid advances being made now wouldn’t have been possible without the slow progress of previous generations. Some of the major advances since Vesalius’ time include the general anaesthetic, antiseptics, the stethoscope, the hypodermic syringe, the thermometer, and the endoscope. 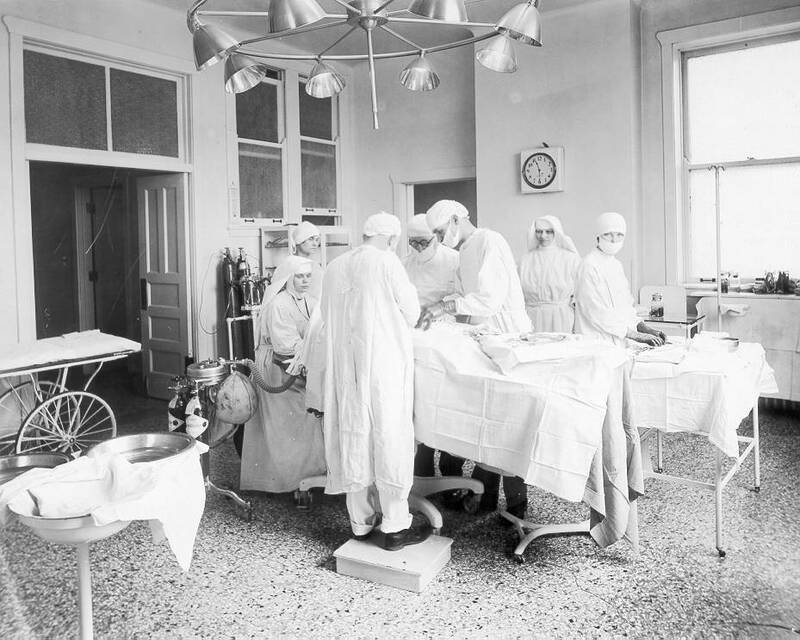 Surgical advances of particular importance in the modern era saw the use of penicillin to fight infections, the advent of organ transplants such as heart, lung, kidney, liver, even complete transplants of hands and faces. None of these advances are yet perfected and the 21st century promises to be a lively time in the history of medicine. I wanted to go to mendciie ever since I firsthand witnessed the service gap between those in developed and developing countries. It was the inspiration from the voiceless who struggled to live through unfair living conditions in Kenya and Haiti, and now I argue with those who claim that the location in which you live does not correlate with whether or not you will become successful. Not only do I want to help those people, but also I want to mitigate the service gap as much as possible.